Charles Dickens doesn't have anything on me. On Sunday afternoon the Atlanta Falcons led by their 2nd year quarterback roll into Foxborough. Monday evening the Dallas Cowboys get take two at breaking in their new digs with a victory. Falcon signal caller Matt Ryan and Cowboy field general Tony Romo are on completely different roads. While their paths cross in a little over a month, both quarterbacks have tall tasks ahead of them. This season will define the Tale of Two Quarterbacks. For Ryan, who has yet to experience the lows of the NFL, his career couldn't have started better. Immediately turning around the left for dead Atlanta Falcons and reaching the playoffs in his first season. 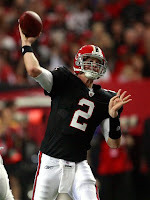 Matt Ryan is back in 2009 looking to bring the Falcons their first back to back winning seasons in franchise history. Coming into the NFL as a rookie in 2008, Matt Ryan had already showed glimpses of the ice which runs through his veins while under pressure: see Stunning Blacksburg. With victories in Green Bay, San Diego, and Minnesota in his rookie year, Ryan has left few doubters in his wake. An 11-5 record in 2008 has given him the tallest of orders this season, beginning this week. Over the next eight weeks the Falcons will go on the road six times. A reeling Patriot team this week, where Ryan will revisit the Northeast for the first time since his days on Chestnut Hill. Across the country after a bye week to meet Mike Singletary and a 49er defense led by the NFL's most dangerous player, Patrick Willis. At Dallas, New Orleans, Carolina, and in the Meadowlands to meet Justin Tuck and the Giant Defense. This season the phenom they call Matty Ice will be thrown to the wolves, if he comes out swinging they'll be no doubt left. Matt Ryan has a story that is about to get a whole lot more interesting. As for Tony Romo, things are heating up and not in a good way. Since his botched snap in the 2006 wildcard playoff game, Tony Romo has been on a wild ride of ups and downs. From his 13-3 regular season in 2007 to the disappointing playoff loss that same season, Tony Romo has been consistent with one thing, inconsistency. Two steps forward, three steps back, that has been the story of the short career of Tony Romo as the Cowboy quarterback. After a roller coaster 2008, Tony Romo has seen the franchise part ways with Terrell Owens and turn the keys over to him, your team and yours only. An exciting week 1 of 2009 with 353 yards passing and three touchdowns, Tony Romo followed it up with his worst performance as an NFL quarterback. After throwing three interceptions to open Jerry Jones' Cowboys Stadium, Romo doesn't have to improve, he must. On center stage this coming Monday night, Romo has an opportunity for redemption. However, it isn't what Tony does over the next two months it what he does come playoff time. If the Cowboy quarterback cannot lead Dallas to the playoffs, and more importantly to a playoff win, you can bet changes in Big D will be on the horizon, now that is pressure. In a three week stretch between November 22nd and December 6th, Romo will be on display not only for the legions of Cowboy faithful but also for his owner. Welcoming the Washington Redskins and owner Daniel Snyder and then playing host to Al Davis and the Oakland Raiders, Jerry Jones wants wins in these games at any cost. Then comes Romo's big night, a rematch against the vaunted New York Giants. Tony Romo will take the field with a shot at redemption, this would be his opportunity to repay the Giants in the Meadowlands for what they've done to his home opener on Sunday night. The tale of this quarterback is better than that of a mid-day soap opera.